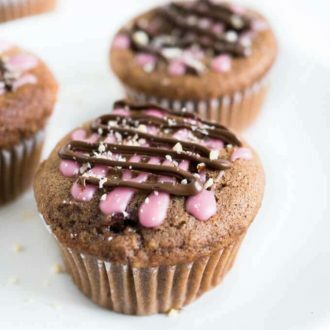 Nutella Cupcakes with Cherries are chocolaty, fruity, and made with Nutella! Preheat oven to 360F (180C). Line muffin pan with muffin cases and set aside. If you're using fresh cherries wash, stem, and pit the cherries or if you're using jarred cherries, drain them. In a bowl mix together all-purpose flour, baking powder, and chopped hazelnuts. Set aside. In a large bowl of an electric or stand mixer, whisk the egg, then add sugar, the egg, vegetable oil, milk, and Nutella. Mix until combined. Gently stir in flour mixture but don't overmix - stir until just combined otherwise your muffins will be dry. Add the cherries to the mixture and use a spatula to stir them in. Evenly distribute the batter between the muffin cases and bake for 20 to 25 minutes until batter is set. Use a skewer to test if the muffins are done. Allow cupcakes to cool for about 5 minutes, then transfer to a cooling rack. I decorated my cupcakes with Nutella and a mixture of cherry juice and powdered sugar.